The badge earner understands the Digital Business Automation market, business challenges, trends, and IBM solutions for Digital Business Automation including: solutions for process modeling, data capture, content management, workflow, decisions, and task automation. The badge earner can identify the right IBM solution to help clients address their business automation needs. 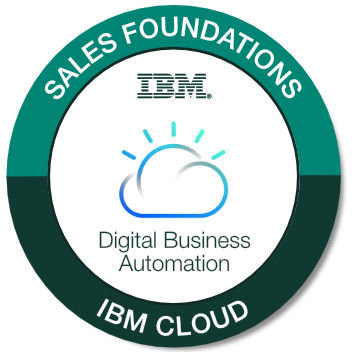 Pass the Digital Business Automation Sales Foundations Assessment Test with a score of 80% or higher. Optional: Complete the Digital Business Automation Learning Roadmap.